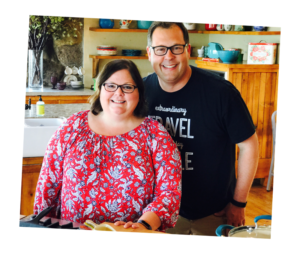 When we agreed to come to Pawhuska, Oklahoma, for the National Indian Taco Championship, we asked locals what we should do when we got to town. 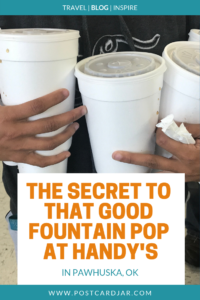 The first thing anyone told us was to go to Handy’s to get a fountain pop because it’s really good, and because they, “have the best ice.” If you’re wondering why anyone would want to go out of their way to get a fountain pop with, “the best ice,” rest assured, so did we. Being intrepid travel bloggers, we are always willing to give something a whirl, especially when it likely won’t cost us more than $1.79. So as soon as we got to Pawhuska, we drove to the corner of Main St. and Lynn, and at first mistook the place for a closed gas station. In front of the store was a canopy covering an island where gas pumps should be but aren’t. The sign on the awning over the door read, “Handy’s – The best little handy stop on the corner!,” which, despite the lack of gas pumps, told us we were in the right place. You’d never guess that the best pop you’ve ever had is inside this store. We had to work to get this photo without a car in front. As we pulled into the parking lot, we were surprised that almost all the parking places were full. We got out of our car and walked to the door noting a sign that said, “No public restrooms.” We scratched our heads wondering how a store that didn’t sell gas and didn’t have a public restroom could stay in business. We made our way inside and noted immediately that all the action was taking place back by the fountain pop dispensers, so we headed that way. People were quickly and efficiently filling cups, then tossing $1.00 on the counter while heading back to their cars. Occasionally, someone would say, “it’s a refill,” and hand the clerk three quarters without breaking stride. Then, we saw someone fill four or five cups, likely buying pop for everyone back at the office. 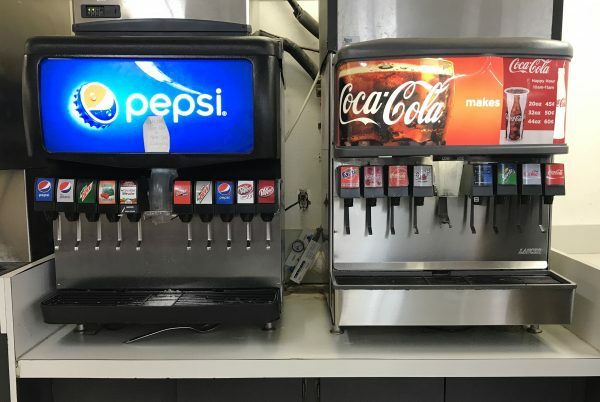 Handy’s offers both Coke and Pepsi products. It’s the best of both worlds. Ann and I stood back for a moment and just watched the action, waiting for a lull so we could orient ourselves. After a couple of minutes that lull came, and we approached the counter to ask the nice ladies who were eating their chili lunch how the whole system worked. Martha and Margie, who are twins, responded virtually simultaneously and without putting their spoons down. They told us, each in her own words, to get a cup, and then we could choose between cubed ice, pellet ice, or, if we wanted, they’d be happy to fill our cup with shaved ice from the back. The shaved ice, they explained, doesn’t dispense well so they have to serve it by hand but they have it because some people think it crunches better than the other two kinds. 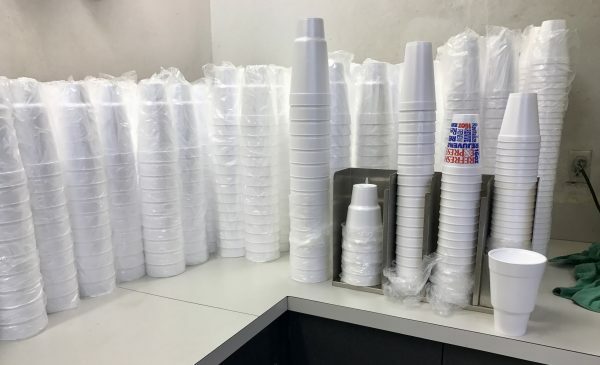 We turned, a bit overwhelmed at the possibilities, and went to the cups, of which there were about 700 stacked up and I’m not even exaggerating. There are plenty of cups at the ready in Handy’s. Ann chose the pellet ice, but at Martha’s insistence that it wasn’t too much trouble, I tried the shaved ice because I was intrigued by its crunchy description. As I waited for my shaved ice, Margie struck up a conversation and asked if we were staying in town. She said they had a house on Airbnb (Redbud Cottage) and they had an opening. We already had arrangements for that night, and their open dates didn’t match our need, but we told them we’d keep them in mind for the future. I collected my cup and headed to the fountain machines. I made a beeline for the Coke dispenser, but Ann was excited they also had Pepsi products. 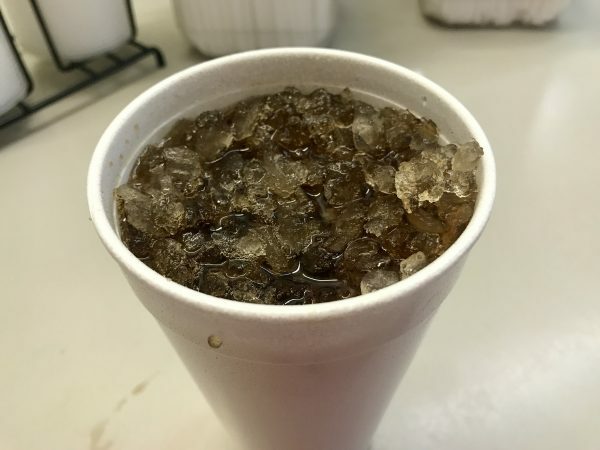 Steve finishes pouring a cool, refreshing Diet Coke with pellet ice at Handy’s. As we filled our cups, Martha and Margie came around the counter, their lunch long forgotten. We chatted some more, heard about how the Pepsi man gave them a banner that declares Handy’s has the best soda in Pawhuska, which is a definite point of pride. They shared that locals returning from trips tell them they can’t wait to get home to Pawhuska so they can get a good Handy’s pop. This sign declares the truth: it’s the best pop in town. During the happy hours, all fountain pop is half price! They also told us that Handy’s sells more pop than the store out on the highway – an accomplishment because that store is open 24 hours a day. Throughout this whole conversation a constant stream of people swirled in and out of the store, each spending less than a minute to fill their cups, pay, and then head back out. I have to admit, I was impressed by this little operation and the very friendly people inside. We thanked them and returned to our car, commenting how much we’d enjoyed the stop and the friendly conversation we’d had. Then, we took a sip of our drinks. I don’t know what the nectar the gods drank on Mount Olympus tasted like, but I suspect they got it at Handy’s. It was seriously the best fountain pop I’ve ever had. And the ice crunched perfectly. This dark and bubbly pop with that good pellet ice is just waiting to provide cool refreshment to a lucky customer. The next day we drove right to Handy’s. We had a long day of exploring ahead of us, and we thought it best to stay hydrated. We walked back into the store, and were greeted like old friends. We chatted some more, and then learned the secret to the good pop: the Pepsi man (bless his soul) turned the mix up just a little bit so it’s a touch richer than normal. We also learned that two hours each day, typically one in the late morning and one in the late afternoon, are designated as “happy hour” and during that time, the fountain soda is half price. 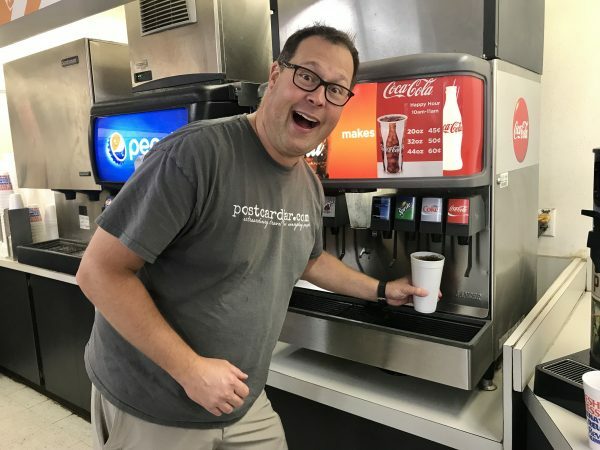 Finally, we learned that they installed a generator so if the power goes out, Pawhuska still has access to its sweet, icy, addictive lifeblood from the soda fountain. I won’t go into a lot more detail, but I will say this, we were back for refills that day (remember, they’re discounted). And the next. And the one after that. When it came time for us to leave Pawhuska we knew we had to go back to Handy’s, and not just for one of their good pops. We had to go back to say goodbye to Martha, Margie and the crew there. They are some of the nicest people we know and we’re glad to think of them as friends. 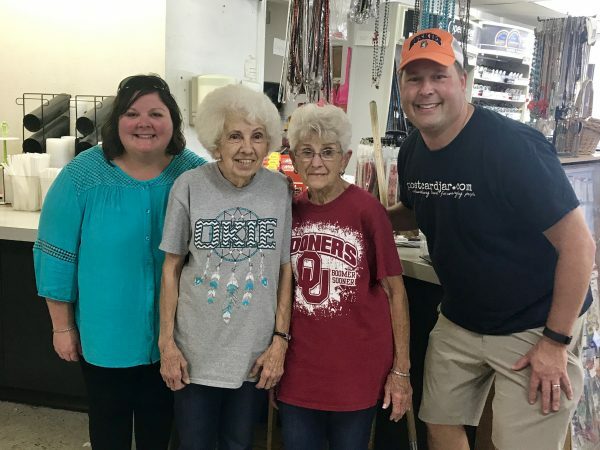 We look forward to our next visit to Pawhuska so we can get another one of their sweet pops and catch up with the even sweeter folks who help make Handy’s, and Pawhuska, such a special place.